With the manual Fastbind C400, you can crease up to 4 creases with one set-up, thanks to special step-shaped guides. 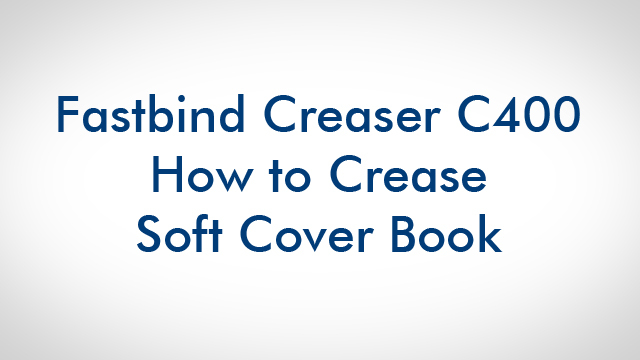 This is the perfect creasing solution for on-demand and short runs soft covers, optimized to work with Fastbind perfect binders: You can do the 2 front creases (spine fold and opening crease) and pre-crease the two back creases in one operation. The C400’s versatility and consistent pressure guarantee a sharp regular crease in card up to 400 g/m² (225 index) and 400 mm long, and numerous other materials. You can also use the C400 to crease other materials like paper, PVC coated cardboard, photographic spreads and more, so you can use it to prepare the panoramic photo content to be mounted on a Fastbind FotoMount or Express binding station.